It has not always been an easy campaign for James Wilson. Strange words for a player nominally behind Wayne Rooney, Robin van Persie and Radamel Falcao in Manchester United’s pecking order. Yet, while the Biddulph -born striker forced his way into manager Louis van Gaal’s thinking during the summer, Wilson has scored just once in the United first team this season. It is a record that has supporters wondering if the 19-year-old’s promotion came a season too soon or whether Saturday’s strike at Queens Park Rangers is the start of something special. No strangers to both the glory of callow youth and failure of inexperience, Old Trafford regulars understand better than most that Wilson’s career could yet go either way. While the teenager has all the tools to make a genuine impact at United – not least because none of Van Gaal’s forwards are assured of a long-term place up-front – Wilson still has a limited window in which to impress. Danny Welbeck’s departure to Arsenal last summer serves as a warning if nothing else: the Dutchman has little room for a water-carrying local hero. After all, the strike was Wilson’s first goal in 12 appearances this season, albeit with only three games coming as a starter. Nor do the teenager’s key statistics obviously support Van Gaal’s decision to offer Wilson a key role in his squad. That single goal has come from just six shots taken across 10 Premier League games, while he has misplaced one in three passes. The pacey youngster, known for his ability to carry the ball with tight control at reserve level, has dribbled just 12 times this season and averages close to one miscontrol per match, for whatever that datapoint is worth. Yet, Wilson’s well-taken goal at Loftus Road potentially says more for the striker’s natural instincts than any data from a limited sample – and perhaps something about his long-term future at United too. Wilson’s ability to cut inside Nedum Onuoha on the run and then, after seeing his snapshot saved, react first to the rebound and slide home was both explosive and composed. Everything that regular observers of United’s academy and under-21 sides will recognise in the player. Perhaps more importantly the goal proffers the player not only confidence, but a modicum of validation in the faith that Van Gaal has placed in an inexperienced teenager. “I’ve been struggling for my first goal this season off the back end of last season,” Wilson told MUTV in the aftermath of United’s 2-0 victory at Loftus Road. If Wilson echoes the sentiments of a starstruck youngster then it is, perhaps, the slow maturation of a player associated with the club for 12 years. The midlander first linked up with United as a seven-year-old, appearing at multiple age groups before making his first team début against Hull City under Ryan Giggs’ temporary stewardship last season. Two strikes against the Tigers promised a bright future even if the anticipated goals have yet to arrive. Indeed, the player has scored goals at almost every level for the club, including five in one game against Newcastle United under-18s last season and seven in nine games as United’s youngsters secured the 2014/15 Under-21 Premier League trophy. Given Falcao’s continuing search for goals and Van Persie’s 18-month-long sabbatical from anything approach his best form, Wilson’s goal at weekend is potentially well timed. The Dutchman has eight goals in 20 games across all competitions, only rarely touching on the form that brought 30 in the 2012/13 campaign. Meanwhile, Falcao’s three strikes this season have come in 14 games; not the return expected of a player who will cost United £43 million should he join from AS Monaco. With Rooney now seemingly permanently consigned to midfield, it is now Wilson’s role to put pressure on his more illustrious colleagues – a challenge Saturday’s goal meets, at least in part. Still, there is room for improvement in the youngster’s game – not least the subtitles of when to break forward, when to run the channels and the moments in the game when support is required from deep. Nor has Wilson’s finishing always pleased his manager, with Van Gaal calling out one miss against Stoke City at Old Trafford that almost cost United victory. Advice imparted by the veteran coach is advice that Wilson is expected to take on board. Aside from Saturday’s goal Van Gaal will have been impressed with the player’s all-round attacking contribution in a 37 minute cameo in west London. Twice the youngster almost found Falcao with crosses whipped into the penalty area, while the player’s movement unsettled a QPR defence that has conceded 39 goals this season. Progress, however measured, will come at a price for United – the player’s contract, last signed in 2012, is due to expire this summer. Wilson joins fellow youngsters Patrick McNair and Andreas Pereira in potentially leaving the club in June. After the debacle over Paul Pogba’s move to Juventus in 2012 Old Trafford’s hierarchy will presumably not to take the situation lightly. 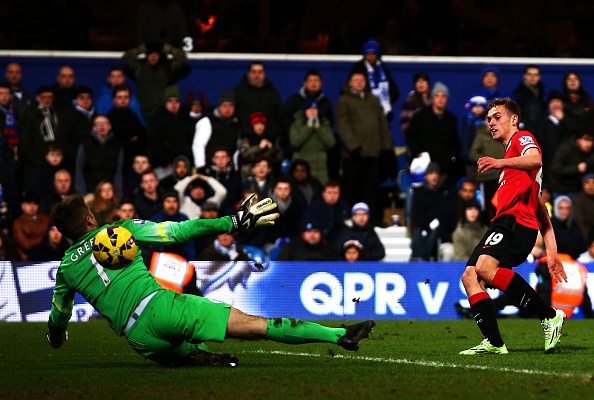 For the moment Wilson continues to make steady if unspectacular progress at United. That Van Gaal has not considering a loan move for the player who has, in truth, just 311 Premier League minutes to his name this season says something. In part about Wilson’s potential, but also of the unconvincing campaign enjoyed by United’s star trio of Falcao, Rooney and Van Persie. It is almost £100 million worth of striking talent that boasts 19 Premier League goals between them this season – just two more than Chelsea’s summer signing Diego Costa. That’s a data point for Wilson to remember – one reason he remains in Van Gaal’s thoughts despite the limited goal haul this season. LaLiga 2018-19: Is Sergio Busquets the weakest link in Barcelona's lineup?